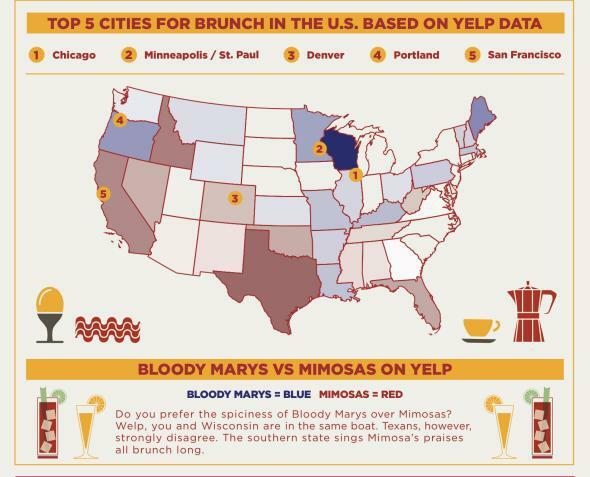 Yelp brunch map: Wisconsin drinks bloody marys, Texans drink mimosas. Earlier this year, Yelp told us exactly where to find the hipsters, yuppies, and frat boys in various U.S. cities. Today Yelp is back with some more utterly inessential yet undeniably intriguing findings from its massive trove of data on trendy young urbanites’ consumption habits. Yes, at long last, we have a definitive answer to a question we’ve somehow never thought to ask: Which states drink bloody marys for brunch, and which ones prefer mimosas? The answers, of course, are Wisconsin and Texas. Wisconsin, that is, claims the title of bloody-maryest state in the union, while Texans opt in the largest numbers for frilly, sparkly champagne-and-fruit concoctions. Yelp performed the crude but presumably effective analysis simply by counting up the total number of mentions of each drink in reviews of the most popular brunch spots in every state. The broad trend seems to be that warm, sun-kissed states like California and Florida quench themselves with sweet orange-y stuff, while the cold, northern states like Maine and Minnesota reach for the Tabasco. But there are plenty of exceptions, including a string of bloody-mary states reaching down the Western bank of the Mississippi all the way to the bloody-mary mecca of New Orleans. In Madison, and I’d say the same goes for Milwaukee, Bloody Marys sock it to you, scoop you up off the floor, than sock it to you again! They’re truly an experience for your senses. In Wisconsin, Bloody Marys are served with a beer back, most often New Glarus Spotted Cow, local to Wisconsin and not sold out of state—you can only drink it here. 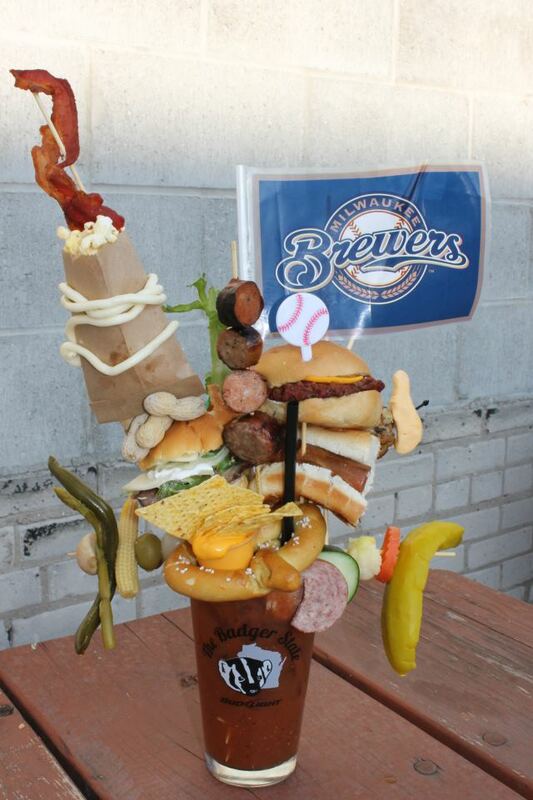 When they’re not served with Spotted Cow, Bloody Mary’s are served with Miller High Life brewed in Milwaukee. I understood only about a third of that, but if nothing else I feel safe concluding from Dane’s sheer exuberance that Yelp has not erred in identifying his home state as a bloody-mary capital. A quick survey of the one Wisconsinite I know on the Slate staff, Emma Roller, reinforced this impression. Asked for theories on Wisconsinites’ bloody-mary affinity, Roller responded via email, “BECAUSE WE CREATE THE MOST GLORIOUS BLOODY MARYS IN THE COUNTRY.” Gah! Feel free to proffer your own theories in the comments. The full Yelp chart and blog post are here.